As a kid, you remember making phone calls on phones connected to the walls. If you ever picked up the phone, realized it was your crush, and hid in a closet to have a private conversation, you were elated when the cordless home phone came out. Could you even contain your excitement when the cell phone came out? Or when cell phones got small enough to carry without a bulky shoulder strap? If things we use every single day like phones are now entirely cordless, why are we still using vacuums that are tethered to the wall? Some say they give better suction, some think that’s just the way vacuums have to be. My review of the 6 best cordless vacuums is here to show you everything a corded vacuum can do, a cordless one can do better. Long gone are the days where plugging in to each and every room is a norm of vacuuming. What to Look for in a Cordless Vacuum? Depending on what your needs are for a vacuum, you’ll want to make sure that you’re getting the vacuum that you not only need, but that you deserve. Vacuums for hard floors are optimized just for that single purpose. If you use them on anything more fluffy than low pile area rugs, the vacuums are sure to stop working. If you have a vacuum for hard floors and carpets, there will typically be two different brush settings. You’ll get a much deeper clean on each kind of floor as each setting is optimized for each floor type. 2-in-1 vacuum cleaners are those that have a detachable handheld option. If you’re the kind of person that likes having one vacuum for everything from cars to counters, a 2-in-1 is the kind of vacuum for you. Each 2-in-1 will work either on a single kind of flooring or on both hard floors and carpeting. If your 2-in-1 works only on a single type of flooring, it will typically be for hard floors only. Before deciding what kind of vacuum to get, you’ll want to think about why you’re buying a vacuum in the first place. Once you decide where you’ll need to clean the most, you’ll be able to choose between the kinds of cordless vacuums we’ve described above. When spending less on a cordless vacuum, you’ll get fewer options when it comes to cleaning modes and will typically have a short battery life. Cheaper cordless vacuums also typically don’t have a handheld option included in them, and may only work on a single type of flooring. Mid range vacuums will include 2-in-1 options that have a detachable handheld vacuum. These vacuums will usually work on both hard floors (like hardwood, laminate, etc) and carpeting without any issues, but typically only get up to 30 minutes of battery time at most. When spending more money and investing in an expensive cordless vacuum, you’ll be buying a longer battery run time, better suction, and features like HEPA filtration or a bendable vacuum body, none of which you’ll find in any cheaper option. 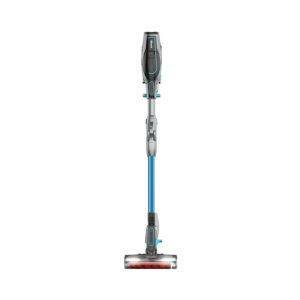 Any expensive vacuum will have options for cleaning carpeting, hard floors, and crevices with your detachable handheld. Once you decide what kind of vacuum you need, you’ll be able to see what price range the features you’re looking for fall under. No matter if your budget is $100 or $500, we have a cordless vacuum option for you that will keep your home as neat and tidy as possible. The cordless revolution is now. Are you ready? Are you ready to splurge on the ultimate cordless vacuum available on the market? Look no further. The Dyson V8 absolute is everything and more; you’ll get every cordless vacuum feature imaginable with the V8 absolute. Actually, you’ll get every corded vacuum feature imaginable, too. 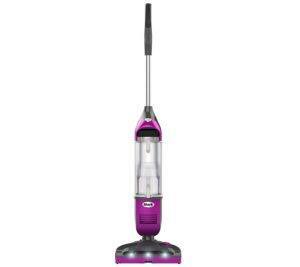 This vacuum features HEPA filtration, 40 minutes of battery power, the ability to pick up pet hair and large debris, a handheld option, hard floor to carpet cleaning, etc. Like we said, it’s everything and more. 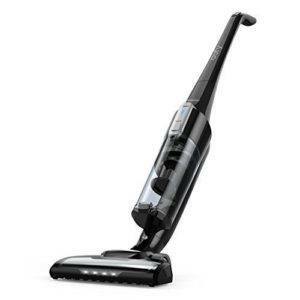 At 5.75 pounds, this is the lightest vacuum you’ll find with this much raw power. There’s even a max power mode if you have a small but exceedingly dirty area to tidy. The Dyson V8 absolute is the ultimate cordless vacuum available, and if you’re in the market for a purchase that will last you years, you’ve found it. Reviewers are absolutely in love. 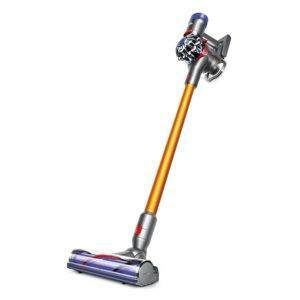 Dyson has improved over and over again on their original cordless vacuum to give you the product you see today. If reviewers thought of a single way on how to improve the Dyson V6, Dyson improved the V8 absolute in 3 ways. Many users owned the V6 before diving in and purchasing the V8 absolute, which means they’ve had first hand experience with cordless Dyson vacuums before. They’re the ones that knew what needed to be improved on and they say the V8 absolute improved on them all. Users say they love that the V8 absolute is much quieter than the V6, has an easier unloading mechanism, and works much better on high pile carpets. If you’re buying your first cordless Dyson, the V8 absolute is the way to go according to them. HEPA filtration is necessary for homes with anyone that has allergies. If cheaper vacuums grind your gears because they let dust back into the air without a care, the V8 absolutely fixes that problem. The HEPA filter not only keeps you from sneezing, but it keeps you from waking the neighbors and letting them know it’s vacuum time. You’ll be able to vacuum your entire home without alerting even your sleeping toddler with how quiet the V8 absolute is. Buying a separate product to do the exact same thing as something you already own is a bit redundant. The V8 absolute eliminates the need to go out and purchase a separate handheld vac since everything you need is integrated into one. Other cordless vacuums may barely last 20 minutes, but the V8 absolute doubles that battery time. You’ll (most likely) never have to worry about having a half vacuumed home if you invest in the Dyson. If you have a mini mansion and you’re wanting to find a vacuum that will clean every floor on a single charge, what you’re looking for probably doesn’t exist. 40 minutes may still not be enough time for you to clean the entirety of your home. The downside to the Dyson is that you aren’t able to purchase a separate battery to plug in if your first one dies. The battery is connected on the inside, so you’ll have to play the waiting game while it charges. If you have very thin and sensitive skin, the button you need to push to work the machine may be hard to manage. Some users reported blistering or skin rubbing off of their hands because they weren’t able to hold the button down for an extended period of time without it hurting. Compared to any other vacuum on our list, this is by and far the most expensive model you’ll see. You’re going to want to make sure that before buying the Dyson that it’s the investment that you want to make. Though it’s the most expensive, it’s also the one users prefer most and that has the most user friendly options. If you’re wanting a product that lasts year after year, the Dyson is the way you’ll want to go. Compared to the earlier V6, the V8 absolute has 150% more brush power and double the battery. That’s a significant improvement over a vacuum that already worked well to start with. Compared to the V8 animal, you’ll get a soft roller head specifically designed to pick up larger debris with the V8 absolute. This eliminates any need to sweep before vacuuming, which means less time cleaning for you. 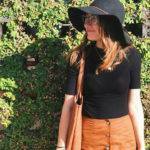 If eco friendly is what you’re searching for, look no further than the Eufy. The battery life on the Eufy is longer than any other battery that we’ve reviewed on this list, rightfully earning it one of our top spots. The Eufy upright vacuum has a giant dust canister, meaning you’ll spend less time making trips back and forth to the garbage can and more time actually cleaning. There are few things more satisfying than looking at the dust holder and seeing all of the grit and grime you’ve collected at the end of your vacuuming session. If you have allergies, the Eufy will make sure the dirt from the ground stays contained instead of returning back into the air with its double filtration system. Eufy says that they “undo spills with strong suction power”, and we couldn’t agree more. This vacuum has the strength it needs to pick whatever’s on the floor up in a single pass. 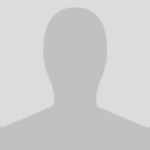 Reviewers say that the customer service for Eufy is among the best that they’ve ever experienced. Any problems that they’ve come across with the Eufy have been fixed by prompt and incredibly helpful customer service reps.
One flaw of the Eufy means that it must be cleaned regularly. If it’s not cleaned after every use or every other use, the suction power and brush will not work nearly as well as when you started using it. Reviewers say that once they realized that the Eufy required regular cleanings, they were incredibly happy with how well their machine cleaned their home. Instead of waiting until the Eufy stopped entirely, they just took a quick 2-3 minutes at the end of every cleaning session to service the vac. Aside from the bit of extra work the Eufy takes to upkeep, users are incredibly happy with how well the Eufy cleans and find it’s a perfect fit for most homes. The dust holder of the Eufy makes cleaning that much easier. If you don’t have to trek to the garbage can 5 or 6 times a cleaning session, you’ll get things done much more quickly. There are two sets of filters in the Eufy, which means that no dust will go back into your home after sucking it up. This is a very user friendly option for those with allergies that loathe the eye tearing that comes along with a dust party in the air. If you run your vacuum on the eco-friendly setting, you’ll get up to 50 minutes of run time, which is by far the longest any cordless vacuum on our list runs. Extra batteries are so not necessary. The swivel head can get around furniture easily and makes it easy to maneuver the vacuum. Though the Eufy isn’t low profile, you’ll still be able to go around your couch legs, even if you can’t get entirely underneath some of your furniture. The Eufy’s major shortcoming is that it does not do well with any type of fuzz. It’ll get clogged, the roller will stop rotating, and vacuuming will become a headache. That being said, if you plan on using this for high pile carpeting, you may want to think again. Anything more than a low pile woven carpet will most likely clog your Eufy beyond repair. If you’re the proud owner of 5 floofy show dogs that shed like crazy, the Eufy probably also isn’t the best option for you. Large amounts of dog fur will end up plugging the roller, just like high pile carpets will. Aside from not working well with excessive fluff, the filter is also quite difficult to clean. One reviewer said he needed another vacuum to get the fuzz off of this vacuum’s filter; you shouldn’t need a vacuum to vacuum your vacuum. Compared to other models, the Eufy is very specialized in that it is made with hard floors in mind rather than carpeting. When looking at other models in the same price range, you will be able to find vacuums that will be able to clean both carpet and hard floors. The difference between the Eufy and others is that the Eufy does hard floors better than practically anyone else. You’re investing in a great product for a specialized purpose at a low price when buying the Eufy. One small but noticeable improvement was that the roller brush mechanism was upgraded from Eufy’s previous model. The new roller brush is much easier to clean, and clogs less easily than its predecessor. This makes a huge difference if you do happen to have pets. Though this vacuum may not be the best with fur, you’ll have a much easier time getting any tangles out because of this upgrade. If the name Elecrtolux Ergorapido sounds a bit overwhelming, you should see the cleaning power of this vac. The Electrolux is a great cordless vacuum option to clean your hard flooring. This vacuum is self standing and doesn’t need a wall to support it, which is a rare feature when it comes to cordless vacuums. It not only supports itself, but it supports you as one of the ultimate 2-in-1 cleaning companions. Small and nimble, the Electrolux can move around any obstacles in its way with its 180 degree maneuverability. This is done without you exerting much effort at all to push its light 5.5 pound body around. If you’re a serial vacuum attachment misplacer, you’ll find comfort in the fact you can store every attachment right in the vacuum itself. This is an incredibly underrated feature that should be praised over and over again for people that can never seem to find what they need when they need it. Overall, the Electrolux has everything you need to effortlessly clean your laminate, countertops & more – which earned it a top spot on our list. Reviewers say that they love a few features about the Electrolux, including LED lights on the front of the vacuum. One user suggested that lights be added to the front of the handheld as well to illuminate cleaning at all times. The unit has a battery gauge on it, which means you’re clearly able to see how much battery you have left. It’s a small feature, but reviewers love how practical it is. The lighting system also tells you if your unit may be overheating. Since you won’t be holding on to the part of the vac that will be heating up, having a blinking warning light is one that’s focused on safety. Reviewers say that the handheld option is a great idea, but the execution isn’t the best unless you use one of the attached tools to better pick up dirt and hair. The vacuum as a handheld won’t do much without the brush or crevice attachment. The self cleaning brushroll is the most unique feature of the Electrolux. You’ll never need to break out the scissors to clean your brush again because this little vacuum does all the work for you. The handheld conversion is useful in that you won’t need to buy a separate vac to clean your car or to get into the crevices on your stairs. The tools for the handheld are actually kept on the handle of the vacuum, which makes storage an absolute delight. The two tools for the handheld are a simple brush tool for upholstery and a long nozzle to get into those hard to reach places. They’re simple, but effective. This is not a vacuum for carpets. If you’re looking for a laminate vacuum, or maybe have a house full of tile, you’re going to love the Electrolux. Otherwise, you may want to invest in another vac. Even when buying the Electrolux, you should know this is for daily upkeep rather than deep cleaning. If you’re in the market to replace your broom and dustpan rather than your shop vac, look no further. Since this is a 2-in-1, the part of the vacuum that’s detachable is the part that collects the dust. This means that the dust bin is quite small and needs to be emptied more times than you’d probably like during a single cleaning. If you’re a fan of having multiple batteries at the ready just in case, you won’t be able to do that with the Electrolux. The battery is in unit, which means if anything were to go wrong, you’d need to replace the entire thing. Most other vacuums in this price range are not 2-in-1s, which means with others, you’re getting a single function out of a machine that’s the same price. Instead of buying a vacuum designed solely for floors and a handheld designed specifically for crevices, you’ll save money in the long run buying a product that does it all. Compared to the earlier Electrolux Ion, you’ll be getting 10 extra minutes of cleaning, a much stronger battery, LED lights, and a self cleaning brushroll. If we were you, we’d definitely spend the extra bit of money to get the extremely practical features of a stronger battery and the self cleaning brushroll to save time and headaches. For an all in one that has some serious oomph, the Shark IONFlex DuoClean is for you. You’ll have the ability to clean everything from stairs to tile to your car with a single machine. This vacuum was designed to save you from bending your back by bending the vacuum’s body instead. For something so lightweight, this vacuum has the power of a much heavier duty machine. Reviewers love that there are already 2 batteries included with the DuoClean. You won’t need to search through google for hours to find where to buy an extra one that will fit your machine properly. Reviewers also adore that the vacuum is very easy to move throughout the home, but don’t love that they need to empty the small dust container over and over again during a single session. The most unique feature of the DuoClean is the IONFlex technology. This allows your vacuum to literally reach into the shortest of places to give you the cleanest clean you can get without any bending whatsoever. You’ll also be able to clean from crown to baseboards with the detachable hand vacuum option of the DuoClean. You won’t need to go get a separate handheld since you’re investing in an all in one. The main downside of the DuoClean is that you’ll most likely need both batteries to clean your entire home if it’s decently sized. If you have a larger home, you may even need a third battery to get the whole job done. The filters for this Shark vacuum are reusable, which is great for the environment; The downside is that the filters take a whole day to dry once you rinse them off. You’ll need to keep your filter spotless in order for maximum suction, so this process can be tedious. 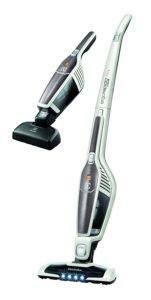 The Hoover Linx is the vacuum on our list has the best handle. You have the ability to see how much battery you have and control every aspect of the vacuum all at the tip of your fingers. If you’re looking for a simple and solid performing vacuum without the hassle of a cord, the Linx is what you’re looking for. Reviewers love that the low profile of the Linx can get under couches and fridges without any problems at all. This vacuum also has rotating brushes that get every speck of dirt off of your floors. Speaking of dirt, the large dust cup is see through, which lets you view everything that you’re picking up. Who knew that seeing handfuls of hair and dirt sucked up off of your floors could actually be fun? Most cordless vacuums take ages to fully charge, but the Linx only takes 3 hours. You’ll also be able to see exactly how much battery life the Linx has left with the nifty battery life gauge at the top of the handle. Oddly enough, many cordless vacuums have the controls toward the bottom of the vacuum. If you’re cleaning and switching from carpet to tile, you’ll want to have the controls at the top; the Linx gives you easy access to all of the buttons you need. The Linx is great for small households, but if you have a two level home, you’ll need to get an extra battery to finish the job. Luckily, Hoover offers extra batteries for purchase; this will be something you want to invest in if you have a lot of floor space. Another major con of the Linx is that there’s no crevice attachment, which makes cleaning those small hard to reach places much more difficult. There’s also a problem with picking up large items, like the stuffing of a dog bed, without clogging; You’ll want to pick those up by hand before vacuuming. The Shark Rotator Freestyle will free you from the shackles of cords while giving you the battery power you need to clean your carpets and hard floors. It’s extremely lightweight, which means that anyone can easily use the vacuum. With LED lights to guide your cleaning path, the Freestyle is a perfect little cordless vacuum to upkeep your home. Reviewers love that this vacuum will pick up any and all pet hair in its path. If you have furry friends making furry messes as they run furrily around, reviewers say that the Freestyle is perfect for you. They also say that they love how few times they have to empty their vacuum while cleaning. You’ll be able to clean for an entire battery’s worth without needing to empty the debris cup. The precision charging function allows you to forget all about your vacuum when it’s on the charger. The charger will automatically turn off when the battery is full, which saves the life of the battery and gives you many more uses out of it. The brush roller of the Freestyle automatically detects when it’s transitioning from hard flooring (like laminate) to carpet, too. The brush will change its speed to best pick up whatever’s on the kind of floor it’s currently cleaning. The Freestyle is not the vacuum you’ll want to deep clean your home. The Freestyle is optimized for keeping homes tidy, but not doing the heavy duty cleaning work. The head of the vacuum also has limited mobility and struggles to get into hard to reach places. If you have a lot of furniture close to the ground, you may want to seek out a different vacuum option. Any cordless vacuum hoover that has the battery integrated on it is a right-down loser. Unless it charges quickly, which most don’t. Also how much spares or repairs cost, all of the above assuming similar cleaning power. As such, the Shark vacuum cleaner has proved better than the Dyson hands down. Separate batteries gives you the flexibility of buying a third or fourth one that will allow you to finish your weekly hoovering in one go, rather than having to postpone it for another three hours. Which means your work likely won’t be done on that day, or it’s something you’ll be not looking forward to. Second, when the batteries will start to struggle to hold charge, you just ditch a $80ish battery, rather than having to change a whole $400+ hoover (I’ve been told that replacing a Dyson hoover battery is just a rip off). Also Dyson relies on a wall charger, hence not being able to take it to your holiday flat, for example, which you could easily do with the Shark, even not taking the twin battery station. There is no button to hold, so no strain in the fingers, blisters, etc. Also the filters do not take a day to dry, unless your house is heated at 13C and you don’t bother to put them on a windowsill above a radiator. I have sorted mine in just 6 hours, so I just don’t know where this day thing comes from. Again, the filters are roughly $10, so buying another pair should do. And to finish, the main unit costs less than $80, so should you need to change it, it won’t break the bank. So all in all, the Shark is a much better all rounder at a cheaper price. My neighbors are Dyson-disillusioned owners and got Shark instead and they are far happier with it. After an exhaustive research and listening to my neighbors, I also bought a Shark dual battery one and have never been happier, more over thinking that I’ve done the best cost-effective decision.